Works very well, takes up little space, and is easy to use. Well built. The rounded back section may not appeal to all people - asides from this, it's a great solo microwave. The Whirlpool Max 35 Green is finished in green, and features the unique Whirlpool rounded back design. This enables you to place the microwave deeper into the corner of your kitchen, thus saving vital space. This obviously affects the overall capacity, but as it's only the corners which have been reduced, it doesn't actually eat into the usable space of the microwave, and still provides a regular 28cm turntable. The green colour scheme may divide opinion, but it is one of very few green microwaves on the market, and is also available in a variety of different colour schemes (see links in the specification below). The overall power level is around 750 Watts, and we found it to be plenty powerful for cooking. Our testers were impressed at just how easy this microwave was to operate, as well as how little room it takes up. It may not be suitable for larger households, but for those who require a small solo microwave, it is ideal. 7 different power levels are included, as well as the amazing jet defrost system which has impressed us in the past. 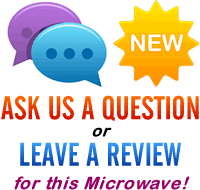 Overall build quality is very good, as you'd expect from Whirlpool, and we'd expect this microwave to provide many years of reliable service. 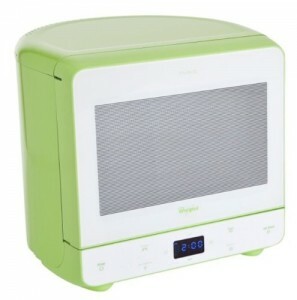 The Whirlpool Max 35 Green is well contructed, beuatifully compact and performs very well indeed. If space is of a premium and you need a solo microwave, then it's well worth checking out this model from Whirlpool.